﻿ Hotel Alkyon Mykonos. JIMAT di Agoda.com! Alkyon Hotel berada dalam jarak 10 minit berjalan kaki dari Bandar Mykonos. Ia menawarkan sebuah kolam renang, dan bilik-bilik yang luas dengan balkoni. Wifi percuma disediakan di seluruh hotel. Bilik-bilik yang elegan dilengkapi dengan TV satelit dan bar mini. Setiap bilik mempunyai bilik mandi yang luas dengan tab mandi. Dari teres peribadi mereka, tetamu dapat menikmati pemandangan teluk Mykonos. Kawasan kolam renang mempunyai bangku-bangku berjemur percuma untuk tetamu berehat sambil menikmati pemandangan. Terdapat sebuah bar kolam renang yang menyajikan koktel dan snek. Sarapan yang mewah dengan produk buatan sendiri disajikan setiap hari. Perkhidmatan bilik 24 jam ditawarkan. Hotel ini menawarkan perkhidmatan ulang-alik percuma untuk ke dan dari pelabuhan dan lapangan terbang. Sebuah perhentian bas dengan perkhidmatan yang kerap terletak bertentangan dengan hotel dan menawarkan sambungan yang bagus untuk ke pantai-pantai di pulau ini. Kakitangan di kaunter penerimaan tetamu yang dibuka 24 jam boleh menawarkan maklumat perjalanan dan mengatur penyewaan kereta dan basikal. Ruang letak kenderaan peribadi disediakan secara percuma di Hotel Alkyon. 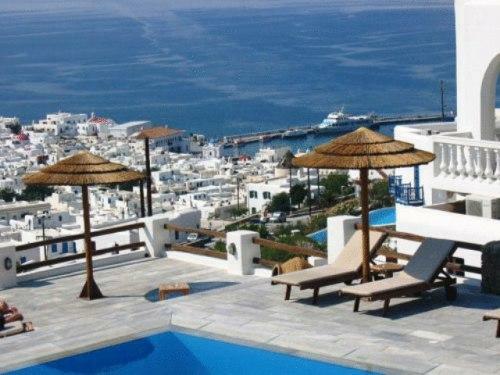 Hotel is located on higher elevation and about 10 to 15 minutes from Mykonos town by taking a downhill path with steps. Room was clean and spacious but the seaview room that we stayed in had only a partial view of the sea. Breakfast spread was pretty sumptuous with a good variety of options. Everything was great,just wish it had a better variety of meals at pool& room service. The mountain view from our room was spectacular. Distance to the city is about 10mins away. U need to be fit as the hills to go and fro, is very steep. Definitely a good workout! The hotel provide service to rent our car/ATV to get around the Island. Service provided by all the staffs were polite, friendly and warm. Swimming pool definitely worth spending the time there just to enjoy the breathtaking view of course! 10 min walk to town, not a bad walk at all. Hotel was beautiful and the most spectacular views of Mykonos. The staff were beyond helpful and kind. The rooms were huge and very clean and beautiful. Delicious breakfast with a view, and overall just fantastic in every aspect. My wife and I booked this room last minute and was able tog et a room. Staff was very informative. They even offered to pick us up at the sea port. Not all places offer you this but if they do it's great as it can be quite expensive to hire a taxi. Not many taxi's available on the island. The rooms are comfortable nothing special, breakfast selection was good, views were amazing, and location was good. 5 minute stroll down hill to reach the main town. Can be a bit tricky working the winding alleyways but once you reach the main area it's so full of life and energy. We recommend this place. The checkin was fast however they took a tad bit long time to get our rooms ready. Hotel lobby is very beautiful. Our room were decently furnished, not luxuriously though but it is good enough for the rate we paid. The balcony was a fantastic make up for the room as the view it provides is out of the world. The swimming pool area is also very very nice. Breakfast was decent and wifi is good. 5/5 for everything. Stay to believe. although we need to walk down the hill to reach the town, the view and environment for this hotel is fantastic. that is memorable especially having the breaskfast there. furthermore, the service there is excellent and the receptionist is extremely helpful. pickup service is provided full of charge also. free wifi and very fast, hotel is clean and decent.nothin luxurious about it. it has wonderful view of the town and ocean but it's a little far from town like 20minutes walk. but dark and quiet alleys to walk up the hills. Excellent location and nice view. i am so glad i choose this place for my stay in mykonos! the hotel is situated uphill with a view to die for and is only 10 minutes walk to the center of the town. the breakfast is included and the staff picks you up on arrival or departure free of charge from the ferry or the airport. sofia is simply the best host ever! thank you alkyon! The receptionist are really friendly, the room is quite big and luxury. rooms are very clean and with good price value. rooms with great sea views and all are very clean and with good price value. service people are very warm and very helpful. they recommend very good restaurants too. thought it's a little long walk to the downtown, but you get a better view and quite environment. Live in the hotel two days. The hotel gave me many good mpemories. Very big room, very good sea view, and very kind service.